Firefox has turns 10 years old. 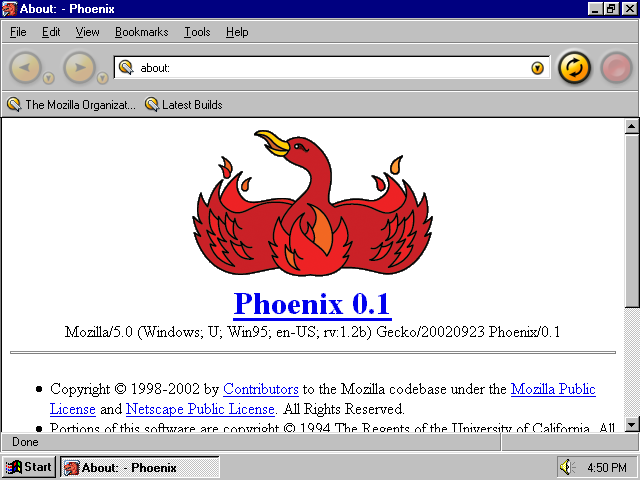 On September 2002 Pheonix was released, later renamed to Firebird, then renamed to Firefox. Mozilla Firefox started as the uber-lightweight version of the Mozilla Suite and has grown as paragon of open web browsers. In the dark old days, of IE6 having 98% market share, Firefox was held the line against the hegemony of a single business controlling how we access information. Firefox lead the technological race to improve the web. And today it has grown into a mature browser, one of the big three, continuing to advocate for the free and open web. Originally a fork of the Mozilla Suite, Firefox used the Gecko rendering engine with a razor thin interface. The idea was to keep it simple and just a browser. It focused on creating an positive browsing experience; simple, direct and fast. Slowly Firefox clawed it's way up the browser usage stats and into our hearts. Firefox is a remarkable piece of software. It holds a special place in history, a pivotal point where openness and freedom could have been but a dream. When most other browsers fell to Microsoft's dominance Firefox stood fast. Stood for us the users, and continues to stand for us. Firefox has a long and glorious road ahead of it.